I had intended to browse stores for last minute offers in Bromley, but everything closing early didn't help that cause. Even if I had better planned I wouldn't have purchased much because an unexpected loan repayment caught me more unprepared than had I contracted herpes. I had spoken to the loan provider prior to this but a miscalculation and an oversight means that I will be depending on Santa to produce the goods tomorrow. At least I was able to leave a present; I decided against any awkward situation and left the gift at the front door! 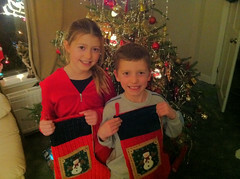 I was disappointed about the loan repayment, but meeting the children and taking the traditional Christmas Stocking photo made me haps again. They're spending Christmas Eve with their mother this year, which means that I will have an extended night with friends.